→Is Eating Beef Jerky While Pregnant Safe? I have been a fan of jerky since I was a kid. This is one of my favorite delicacies. My mother used to make them for me during weekends and every special occasion. She also loves jerkies, too. But there was a time that she temporarily stopped eating this threat. It was during she was born my little sister. Later on, I learned the reason for this. She told me that eating jerkies are not really suitable for pregnant women, especially if you don't know the temperature used for the drying process. ​If you insist on eating jerkies while you are pregnant, you are risking your baby to toxoplasmosis. And this one is not a thing that you can joke about. ​T﻿﻿oxoplasmosi﻿﻿s is a typical infection in people. However, it is not only found in humans only. It can also be present in animals and specific types of birds. Specifically, this infection is caused by a parasite. ​Generally, toxoplasmosis is not harmful to humans. But for the babies inside the wombs of their mother, this infection is pretty deleterious. It can cause loss vision and permanent brain damage. Although the risk factors for this illness are small, you still have to take necessary precaution. ​If you are worried about this, you should consult your doctor for possible testing. After all, frequent testing is not advisable for pregnant women. Therefore, the best thing that you can do is to avoid the possible causes of this infection. ​The consumption of meat that has not been fully frozen or cooked is one biggest causes of toxoplasmosis. In this case, jerkies are a waving red flag. After all, this food is not prepared to cooking. It is not fried, simmered, or anything like that. Instead, it is only dried up. Even if you crank your microwave oven to 165 degrees Fahrenheit or more, it is still not a guarantee that the jerky is already safe. If you badly want to eat a jerky, I recommend that you should preheat the meat in boiling water (170 degrees Fahrenheit or more) for around 5 to 10 minutes. You should do this before putting the meat in your oven. But if you want not to risk it, then you should just resist the call of your appetite. Your baby will certainly appreciate it. Another cause of toxoplasmosis is having contact with soil or any substrate that has cat feces. Because of this, many doctors recommend that pregnant women should prohibit themselves from any gardening activities. Moreover, you should not touch anything that has been infected by feces of a cat. In fact, you can get this infection by just eating food that has been in contact with your cat. ​If you are currently experiencing any of these symptoms (assuming that you are pregnant), better consult your doctor. The infection can be diagnosed through a blood test. 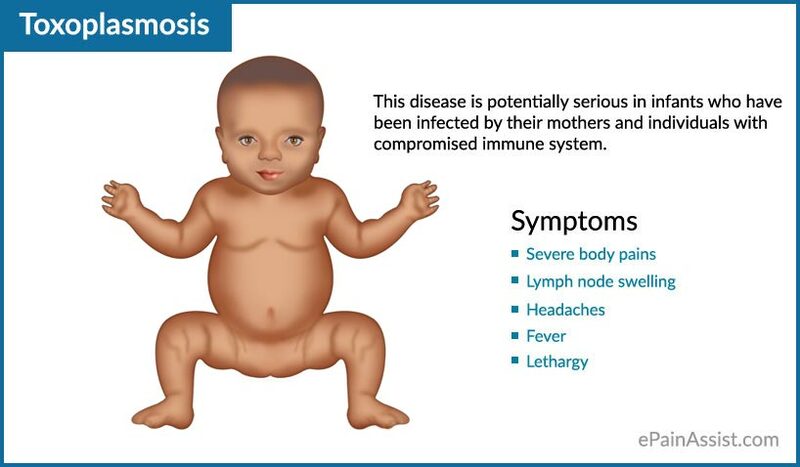 If you have already given birth and you had this infection while you are still bearing your child, then have your baby tested. Your doctor would take fluid samples from your child for further diagnosis. ​As I mentioned earlier, adults just don't get experience anything bad even if they have this infection. The latter just dissipate on time. But it is a different story for our babies. Their immune system is not yet fully developed to counteract these detriments. ​If you have been diagnosed with toxoplasmosis while you are pregnant, your doctor will recommend a particular medicine to you. Specifically, it is a form of antibiotic known as spiramycin. This particular medication can prevent your baby from being infected. Moreover, it could also lower the chances of further health problems if in case your child has already got this infection. ​However, your doctor might still require you take other medications and treatment, depending on your diagnosis. But of course, you can avoid all these hassles if you will avoid the causes of toxoplasmosis. Overall, I still recommend that you should not eat beef jerky while pregnant. Even other types of dried goods are not for consumption, too, during this special period of your life. Instead, I simply suggest that you should eat fruits and vegetables. Aside from being healthy, these foods can certainly gratify your appetite! In this way, you can be sure that you will give birth to a happy and nourished baby! ​Hello, I am Jennifer Smith, a simple housewife with two kids. I currently write on a personal cooking blog called J﻿ennifer’s﻿ Cozy Kitchen. Obviously, my heart is inclined to eating and exploring various cooking methods and recipes. I am also an advocate of living and eating healthy. If you want to contact me for questions, comments, and suggestions, just message me on this address: Jenniferscozykitchen@gmail.com.